The British Standard Small Bow Shackle Safety Bolt Type has a type ‘E’ bolt and nut / pin. Made from quality high tensile steel they have a 5:1 safety factor. Self coloured of hot dipped galvanized are the finishes that are available for you to choose from. We also stock a range of stainless steel shackles. Made to BS3032 table 4 – 1958 you can be rest assured of its quality, and the type of safety bolt will ensure it remains in situ thanks to the cotter pin which prevents any hazardous unscrewing of the bolt. Available in many sizes and safe working loads there is sure to be a small bow shackle safety bolt type to suit your operation. The internal bow width ranges from 7/8 inch up to 5 1/8 inch, and working loads go up to a great 13 tonne. You can see all the technical data in the table below. 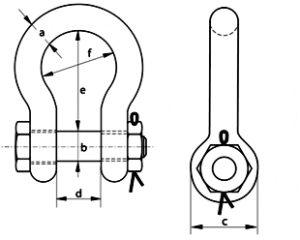 Still not sure if this is the right shackle for you? Read up on some other shackles here; still undecided? Call us now on 01384 78004 of email us your enquiry from the contact us page or rapid enquiry form. Remember we also manufacture web slings and wire ropes to suit your requirements as well as all the necessary end fittings and connections, so you should be able to get everything you need from one place. 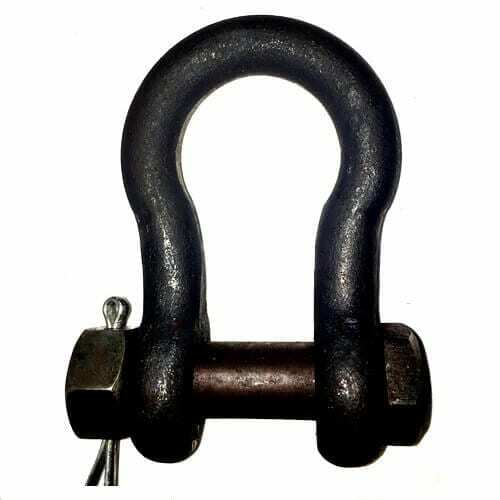 British Standard Small Bow Shackle Safety Bolt Type Overall rating: 5 out of 5 based on 6 reviews.